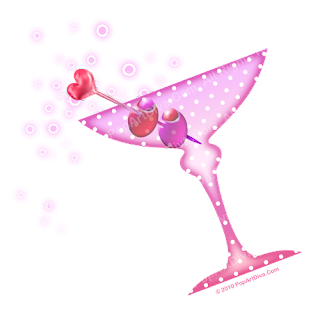 PINK MARTINI - New Martini Art from The Martini Diva! 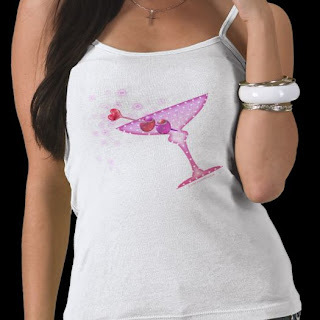 I started with the Pink Martini because I wanted a new graphic for my Pink Themed Martinis and Pink Tiny Foods. Pink Martini Parties are all the rage and I had done this series of pink drinks and appetizers a few years ago to throw a Pink Party for a good friend who had just completed her chemotherapy for breast cancer. I've had this thing lately for polka dots. I'm not really sure why but it might be a retro thing. I used them as a pattern inside the martini glass then added a fun heart topped martini pick. I hadn't planned to put in a garnish but the martini pick just looked silly without something on it so I put in an olive and turned it pink - how fun is a pink olive?. Then I thought it looked lonely (and who ever asks for just one olive in their martini?) so I added a second pink olive. I love the pink olives. I tipped the glass to indicate a little movement and added some fun little pale pink bubbles flowing out of the glass. Done! Fully Customizable Posters, T-shirts, Invitations, Aprons, Sneakers, Business Cards, Greeting - Post Cards, Postage, Cups and other gear at The Martini Diva Boutique.